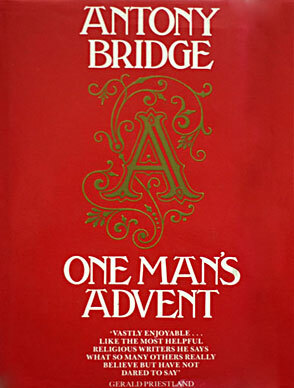 When I re-read One Man's Advent I felt it was the culmination and consummation of nearly all of Tony's great theological and inspired thinking, and of his quite unique way of awakening the reader's awareness to the deeper level of Christian teaching and understanding. And so I set it out here on the Website for free download by way I hope of preserving that remarkable gift and sharing it with the readers of this Website. This exhilarating and fiercely honest autobiographical account by the Dean of Guildford describes a sort of pagan's progress from militant and convinced atheism, through years of doubt and internal struggle, to an eventual acceptance of the Christian faith. Antony Bridge writes with candour, lucidity and humour about some of the most fundamental personal and moral problems that trouble large numbers of intelligent people today who are searching for their own meaning and significance. This is no conventional account of a Billy-Graham -type conversion. It is a marvellously positive testament, full of controversial and challenging insights into the nature of life and human fulfilment, love and suffering, and ow the Christian God can transform every aspect of human experience. The author paints an attractive picture of his life as a successful artist in the 1930s, happy in his atheist convictions and bohemian lifestyle, before some of his experiences during World War II began to undermine his rationalism., Atheist materialism could no longer provide him with an adequate interpretation of the world, but the version of Christianity he had known as a schoolboy could do no better. he describes the occasional moments of illumination on his long journey to full acceptance of, first, a generally religious view and, second, Christian belief. 'One of the most exciting events along the way', he writes 'was the discovery that science, art and Christian faith are united at their most creative depths by a common dependence upon moments of disclosure, a common belief in order, harmony and beauty, and a common recognition of the significance and value of ordinary things.' One Man's Advent is the story of an inward journey that will help other people travelling along the same road, and will enhance the lives of all who read it.